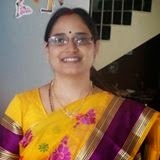 Hi, Thank you friends and viewers. 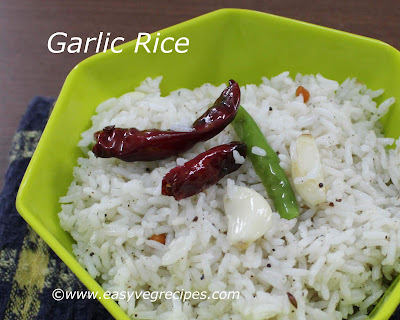 Today I will post how to make garlic rice recipe. 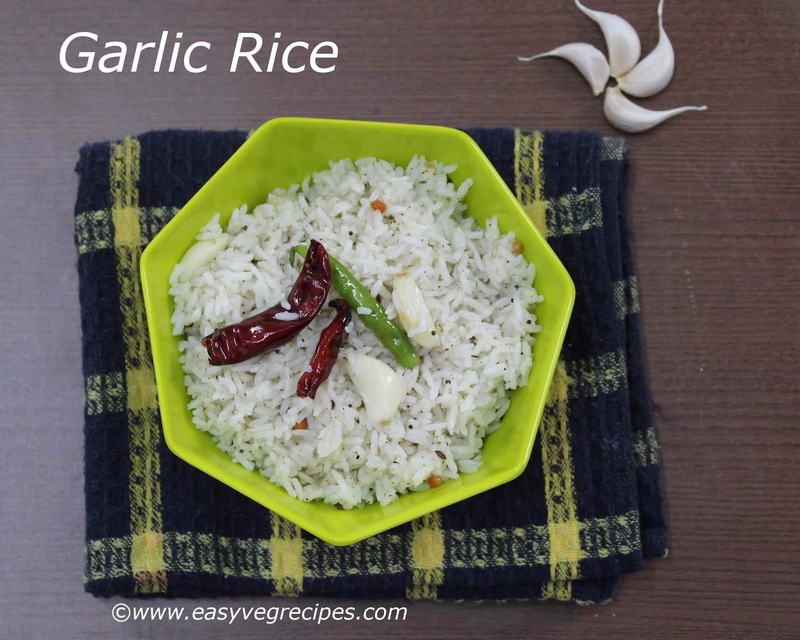 Garlic rice is a really easy and simple recipe. I have tasted this recipe in a restaurant in Vizag for the first time. I liked the mild taste of it. After returning from the trip, I tried it at home. It came very nice. Kids also liked it very much. It has the light aroma of garlic and mild spicy taste of pepper powder. This is another one pot, simple rice recipe. Garlic Rice -- easy veg recipe -- rice made with garlic and pepper powder. Pressure cook rice, with 1:2 ratio water, for 3 whistles. Remove the skin of garlic cloves and press them a little. Slit green chillies and keep them aside. Heat oil in a kadai or pan, add mustard seeds, cumin seeds, black gram and bengal gram. When they start spluttering, add garlic cloves, curry leaves and slit green chillies. Saute them for a while, add whole red chillies. While sauteing them add cooked rice. Mix it well. Mix it well so that the aroma of garlic combines with the rice grains. Add salt and pepper powder and mix it well again. Check the salt and if required add more. Serve easy garlic rice when it is hot. Thank you for visiting my blog. Hope you like all my recipes. Feedback, comments and suggestions are welcomed. For more rice recipes click here. Feel free to contact me through mail: sailajaangara@gmail.com OR east@easyvegrecipes.com OR Whatsapp:+91 99667 00045.